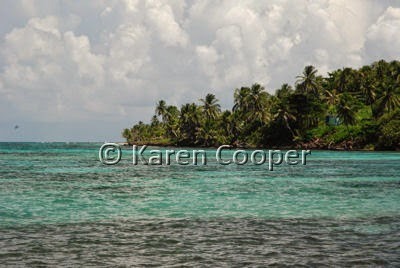 There are 2 islands off the eastern coast of Nicaragua, Big Corn and Little Corn Islands. Both have very unique charm and laid back atmospheres. Getting to the Corn Islands is not for the faint of heart if you choose not to fly in. There are 2 ferries (one takes cars if you have wheels you want to bring along) and "pangas". All travel on the Rio Escondido, a large muddy river that acts as a major transportation route from el Rama to Bluefields and the Corn Islands. This whole area is steeped in humidity and history. From tales of pirates and treasure to the colour and accents of its people, it is truly a magical place seemingly lost in time. There are several interesting and unique places to visit on Big Corn Island. One of my favorite places to grab some good island food and an enjoyable afternoon snorkeling is Anastasia's. Robert Finley, one of the owners, took time to tell me of the reefs and fish to be found right off the shore here. Robert is a transplant from North Carolina, USA. Southern hospitality works anywhere in the world you find it! Another jaw-dropping gorgeous location, called Casa Canada, is on the south end of the island. Well worth a visit to either stay awhile and relax in total luxury, or pass a fun filled afternoon sipping something ice cold from the bar and chatting to the eclectic mix of staff and visitors. I wanted to spend a couple days here and let the island pace seep into my bones. I ended up staying over a week, inertia made me forget time. And the sheer joy and spirit of the people living here made me forget the world has any problems that can't be fixed with a smile. I think that should be the definition of paradise. I am thinking of going to little corn and I am wondering if I can eat fruit off the trees.Or is it the kind of place where everything is privately owned and that would be stealing? I had no idea Nicaragua was so beautiful. What magnificent sites. Thank you for sharing. I'm enjoying your photos of Nicaragua!Nice place to spebd a week. Wow...I wish I lived there...Your pics take us to places we dream of or have them in the ''wishlist''...Thank you so much for sharing. How do you get to visit so many places? I agree to psshakkottai. Really one of those ideal places that I wanted to be in. And I envy you for you were able to experience the wonders of nature. sigh!